It’s not that long ago when motorists often faced wooden railway gates at road crossings within Melbourne’s metro train network, closed by VR staff to prevent motor vehicles proceeding when trains were scheduled. Yet who would have guessed that most early regional Victorian Railway (VR) lines also had such gates at many relatively low traffic rural road crossings in the late 19th century. This was so for the original Wandong, Heathcote, Sandhurst line, built 1888-1890. At that time, each gate installation had a permanent Gate Keeper plus a railway house as well. One such Gate Keeper’s house still remains in Heathcote. Most rural railway gates were removed during the early part of the 20th century. Seeking to reinstate elements of former railway historical infrastructure, on the now O’Keefe Rail Trail, Friends of the Bendigo-Kilmore Rail Trail members were keen to obtain a set of original railway gates. After a long search, an old set of stored gates in a poor state were finally located in Melbourne, and then subsequently approved for allocation to the group by PTV. 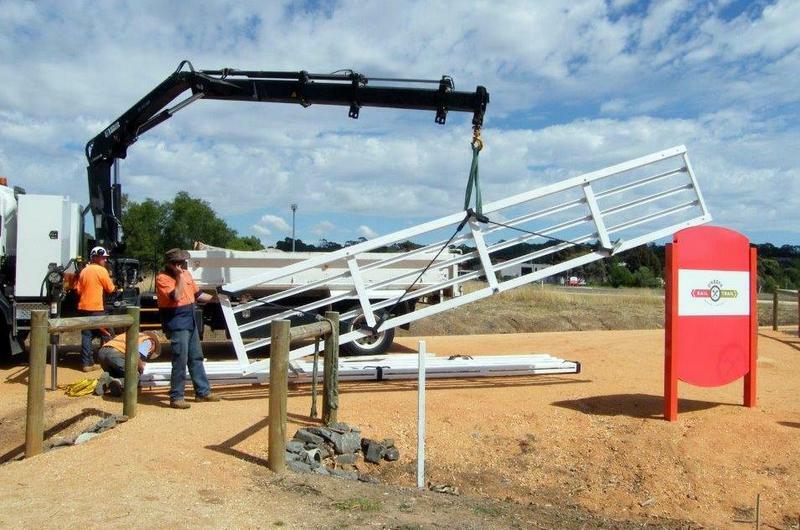 With a City of Greater Bendigo Community Grant awarded, and assistance from Semi Trailer Sales Pty Ltd, Friends member Ken Hanson set about leading a project to rebuild these gates in Bendigo. 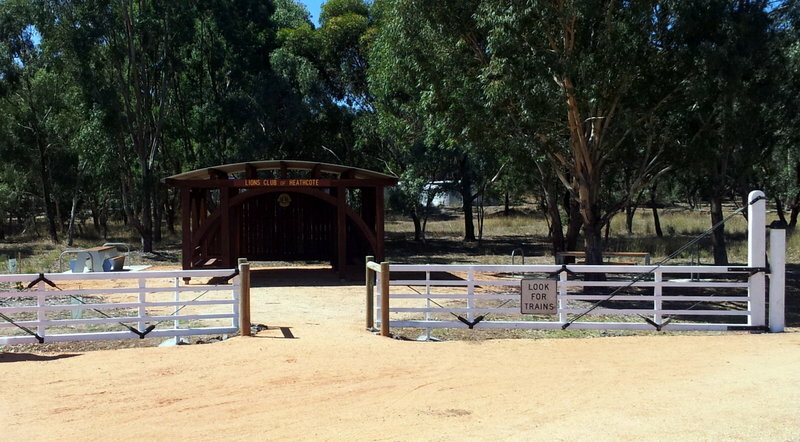 With additional assistance from Powercor, Council, Lions Club of Heathcote, and painter John Mead, the 6-metre-long gates were installed with their final coat of paint being applied at Heathcote. This siting was close to an original gates location at Herriot St, near the former Heathcote Railway Station. The gates now provide a ‘safe’ pathway for trail users into the Lions Club’s rail trail shelter area, a great place to meet people, and enjoy what the O’Keefe Rail Trail now has to offer. Thanks for your recall and comments Ray, a great reflection on history. That collision involving your father’s engine is one of the recorded accidents on that line. It appears that all but one set of railway crossing gates on this line were removed before the end of the 19th century (1900). The only set left, at that Hume Highway crossing near Kilmore, being removed during the early part of the 20th century. An update regarding the removal of this line’s public crossing gates. There were just two crossing gates left after 1900, with one set being at Axedale (the crossing at the up end of the Axedale Station) that were removed in October, 1912. The other set were at that Hume Highway crossing, just south of Kilmore, which were the last to be removed.